A new plan for Christian self-autonomy within Iraq’s Kurdish region has sparked debate among Iraqi Christian leaders desperate to halt the mass exit of Christians from Iraq. Iraq’s half-a-dozen or more historical churches, many of them dating back to the first three centuries after Christ, agree that something must be done to preserve their existence. But consensus on a solution has proven elusive. 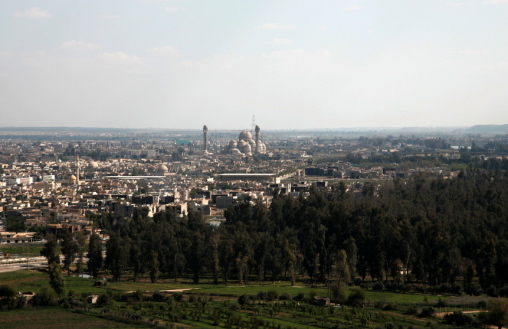 The city of Mosul, Iraq (copyright 2006 Bryan Myhr, via iStockPhotos). Istanbul, December 22 (Compass Direct News) –- With church-bombing and priest-kidnapping on the rise in Mosul and Baghdad, Iraq’s Christian population is estimated to have dropped below 450,000, half the size it was in 1991. Iraq’s half-a-dozen or more historical churches, many of them dating back to the first three centuries after Christ, agree that something must be done to preserve their existence. But consensus on a solution has proven elusive. Sarkis Aghajan is one man who may have the biggest say in the future of the Christian community. As Iraqi Kurdistan’s Minister of Finance and Economy and a Christian member of the governing Kurdistan Democratic Party, Aghajan has financially supported thousands of Christian refugees from the south while calling for a Christian region attached to Iraqi Kurdistan. “I demanded the right of autonomy for our [Christian] people – Chaldean, Syriac, Assyrian – to be fixed in the Kurdistan Region Constitution,” Aghajan told Compass by e-mail. Aghajan publicly backed a statement last month by five Christian political parties calling on drafters of Kurdistan’s Regional Constitution to guarantee an autonomous Christian area in the Nineveh plain, Iraqi Christianity’s ancestral homeland north of Mosul. “Since the Nineveh plain falls within the expanded boundaries [of the Kurdish region], we propose to include in the constitution a clear text of our people’s right to autonomy within the said plain,” the November 10 document stated. But some Christian leaders have opposed any plan to cede the area to Iraqi Kurdistan, saying that Christians and other minorities need a completely separate federal state. Most vocal on the international scene has been Pascale Warda, former Iraqi Minister of Displacement and Migration. Warda visited the United States in October to drum up support for a separate federal state for non-Muslim minorities in the Nineveh plain, a plan supported by the Assyrian Democratic Movement (ADM). The ADM’s campaign has been fueled by reports from the Assyrian International News Agency that Kurdish police and militia have been terrorizing Christians. According to a December 18 Religion News Service article, Kurds have also seized land owned by Assyrian Christians. Compass sources in the area were unable to confirm these reports. In a November interview with Zinda Magazine, Iraqi Kurdistan’s Christian Tourism Minister Nimrud Baito denied outright allegations that Kurds were taking Christian lands. Despite negative reports, Kurdish leaders appear to have made a sincere bid to attract Christians to their northern region. Christian finance minister Aghajan has made good on that promise, constructing more than 100 new villages and churches for Christian refugees. “Over 5,000 houses have been constructed for Christians, in addition to schools, health centers, Internet centers and occasion halls,” Aghajan told Compass. Even Kurdish Muslim converts to Christianity enjoy a wide range of freedoms traditionally limited to the historic churches, building churches and openly identifying themselves as Christians. “I’d rather see a Muslim become a Christian than see him become a radical Muslim,” Kurdistan’s regional prime minister told Radio Sawa in May. But incorporating a Christian Nineveh plain into Iraqi Kurdistan is more complicated than squeezing a guarantee into the new Kurdish constitution, up for vote in April 2007. The real test for any form of autonomy would be winning the required approval in Iraq’s national parliament in Baghdad, where minority Christian ministers would need to bargain for the backing of Kurdish or Shia groups. Three districts that constitute the Nineveh plain would also need to hold separate referendums to obtain self-government, within Iraqi Kurdistan or otherwise. Kurdish forces currently occupy the districts and provide security, though the area belongs to the Mosul governorate under Baghdad’s central government. Many of the villages surrounding Mosul, the biblical city of Nineveh, are majority Christian. But the plain remains diverse, holding Yezidi, Shebek, and Sunni Arab groups. Observers told Compass that any referendum for autonomy would likely need at least a coalition of Christians and Yezidis to succeed. It is highly unlikely that Iraq’s Sunnis, who currently control the Mosul government that administers the three districts, would support a plan for any form of minority autonomy. And that is where problems may begin, Chaldean Archbishop of Kirkuk Luis Sako told Compass. One of the few Iraqi clergymen to raise his voice on the issue, Sako said he expected that any announcement that Christians were pursuing their own region would violently backfire. The archbishop said that he doubted the Nineveh plain could be made secure, sandwiched as it is between the Arab and Kurdish regions. But some leaders pointed out that attacks on Christians were already on the rise before any plan for Christian self-autonomy was publicized. “We’ve been seeing attacks against our people in the Mosul area anyway,” commented Tourism Minister Baito, a strong supporter of Christian autonomy within the Kurdish region and head of the Assyrian Patriotic Party. © 2005 Compass Direct. – Posted on Religioscope with permission from Compass Direct. – Compass Direct (Santa Ana, California) is a Christian news service dedicated to providing news on situations and events facing Christians persecuted for their faith. Compass Direct maintains an extensive network of news bureaus and correspondents around the world.